So 2 hours after my unfortunate late start I have the basic gameplay mechanic all programmed! And I think I’ve figured out the aesthetic of the game. It may seem odd to start discussing the theme as the last 3 hours of the voting stage tick away, but there’s a lesson to be learned in the theme that should be at the heart of any creative work. It means a lot to me, and from the games I played I felt it escaped many people. Here’s my interpretation of minimalism, and how to use the concept to craft innovative new games. There are two groups of people I feel have actively, yet perfectly equally missed the point of designing minimal games. There’s camp A who took minimalism as “removing stuff” and made single button pixel-style black and white games, and camp B who feel that any game made in 48 hours is minimal by necessity and just went and made the game they’d been planning to all along. Both arguments could be considered true, but fail to cut to the core of minimalism, which is to reveal the essence of a subject. To say this should, by necessity, take less time than a non-minimal game, is a flat out lie. Team Ico have never spent less than 3 years developing a game, and while all their games are rich 3D adventures, they are all minimal to the core. Minimalism is a subjective and artistic term, meaning that creating a minimal platform game could take you in many directions. There is no “one true” minimal game. Adam Saltsman’s game Canabalt was designed as a minimal game from the outset, and it created a rich sub-genre which still flourishes. It’s not minimal because it is controlled by one button, or that it only uses a limited color palette. These things certainly help, but Canabalt is minimal in how it targeted the very root of the genre, and selected one specific element to run with – jumping. 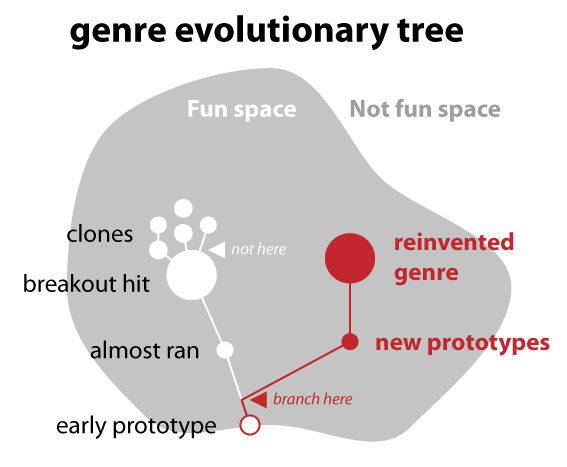 This diagram, taken from Dan Cook’s fantastic blog post, shows the power of reinvention. There are many other ways to reinvent, but minimalism is a powerful tool. I played a LOT of Canabalt clones from this a tournament. I don’t want to appear to be slating anyone’s work, because the power to test ideas is my favourite aspect of Ludum Dare and I have made many a shoddy Canabalt clone myself, but I still want to address the issue. It is my belief that adding any new idea to Canabalt is a step backwards, because it is the act of watering down the essence of the game. To reinvent it, it must be stripped back to it’s core. A minimalist approach might have been to take another aspect of the platformer, such as the platforms, and consider their essence, and their purpose. I think a good example of a game that does this is Doodle Jump, which takes the idea of platforms as a tool to help you reach places in a very pure way. So play some more games with the time left, and ask yourself which parts of the game could have been trimmed, and which parts helped make the total something more. To wrap up, here’s some great games from this LD that I thought understood the theme perfectly. You Must Escape: A game about mapping space with sound. When the enemies turn up, the concept complements them and makes them more terrifying than and visuals that might have been added. Follow The Line: A game about twitch responses. There is nothing thrown in to distract you here, allowing you to focus on the single goal of the game – survival. Centroid: A game about finding the center of mass. While I don’t like the end state of the game, it’s a beautifully simple mechanic where you actually feel you’ve learned something through playing. So, minimalism turned out to be a great theme for me. I’d already been thinking about the idea of just doing a simple, fun game to relax after all of the hard work I’d been doing on my other game, so everything worked out. But not before a sidetrip through the insanity of development that was just a little bit more insane than usual. I decided to take a well-known genre and pare it down to the core experience. Hence, a bullet-hell shooter with no shooting. The player doesn’t even have to click on anything–the click at the start is just to make sure your web browser is focused. While the art style references De Stijl, I felt that for a game the essence was in the mechanics, not the visuals, so I avoided the visual minimalism of horizontal and vertical lines in favor of an interactive minimalism of a handful of actors and the tightly defined but emergent relationship between them. Despite everything in the game being a square, you can pretty much instantly tell how they relate to each other just but how they move and interact. I like how that turned out. Technically this didn’t go wrong so much as I knew going in that this was going to be an issue. I had a major paper due the week of Ludum Dare, so there was no way I would be able to devote the full time to the game, or even very much of it. I actually wasn’t sure if I was going to participate at all until a late evening conversation on Saturday made me realize that I had to get this idea out of my head. I always make a point of sleeping properly and not disrupting my usual routines, so even though I had deadlines about to steamroll me I ended up putting in about three hours on the game Saturday night and picking development back up at about ten or so on Sunday. In total, I probably spent about twelve to fifteen hours on the game. I knew I wanted to get audio into the game, but a bug earlier in the day had put me behind, so I ended up with three hours to go, no audio–and no idea how to add it, because Processing.js doesn’t natively do audio. I had to learn HTML5 audio and make the sounds in three hours or less. Preferably less, because I like to leave some extra time at the end of Ludum Dare for breathing room. It worked in the end, but I’d have liked to have a bit more attention to the audio–but not to add much, because the minimalistic effects that are currently a part of the game do fit the theme. Just be glad my screeching temp sounds got replaced. The procedural generator I wrote is fairly clever, given the time constraints. It divides the different possible features a wave can have into buckets and then uses Perlin noise to select a subset of those features to use. But it needs a bit more tuning than it has. I was the only one testing it, so I knew the ins and outs of the generator, but other people take a bit of time to figure it out and mostly die when the difficulty curve ramps up really sharply at the fifth level. If I had been able to watch other people play the game I probably would have been able to avoid the other big problem, which is that there’s no “Game Over” screen. I didn’t need it while I was testing, and I didn’t care what my score was, so I didn’t notice that it was missing. But having one turns out to be really important for the game. Adding it in was a simple 26-line change, and the post-comp version has it, but I feel that if I had other people test it during primary development the game would have ended up even better than it is now. Processing was a great platform to work with. I had to implement my own collisions, but that wasn’t a problem since I already knew how. I was able to use a lot of programming tricks that are technically feasible anywhere, like adding easing to most of the movement, but Processing’s immediate feedback let me fine-tune to get the exact feel that I wanted. And feel is a huge part of a game like this. Processing.js was easy to get working once I figured out which PVector functions weren’t implemented yet–in fact, it was so easy that I switched to make the web version of the game the primary one for the competition release. I gave myself permission to not do everything. That is, the game wasn’t going to be the best graphics, the best sound, the most innovative concept–I was going to focus on making a game, not starting a revolution. Minimalism turned out to help with that, since it let me make a game that is deliberately about the most basic expression of a core idea. Speaking of which, minimalism gave me an excuse for avoiding feature creep. Every time I had an awesome idea for something that would be an awesome addition to the game, I could just say, “Nope. Minimalism,” and go on my way. I took a few minutes on Sunday to set up a git repository for the game. I never ended up needing it, but it let me experiment, knowing that there was always going to be a mostly-working version of the game that I could go back to. I can, right now, jump back to the compo-version or forward to the post-comp changes with no trouble at all. If you aren’t using source code control, take a few minutes to learn how. You won’t regret it. Keeping yourself healthy is important, even during a crazy crunch situation like this. I made a point to sleep and eat–and that really helped when I needed the energy and concentration to learn a completely new thing three hours before the deadline. Finally, the community is a big part of why I participate. I make a point of rating a bunch of games–nowhere near all of them, but as many as I can find the time to do. I’ve already incorporated some of the suggestions I’ve received into the post-comp version I’m working on. I try to leave feedback that will help make the games better and I encourage you to do the same. Hiya folks. This is my unfinished and late game, pksl. Even in its current state it is quite fun! Use the arrow keys to collect pixels before they reach the origin! So, yeah. With family and such I wasn’t able to pull together the basic movement system until today. I set a reasonable expectation for myself, a one button Pac-man. However the delay cost me not being able to add more levels, smooth the movement or find all the little bugs in the movement. Still for my first LD I think I managed all right. Tools: Game Maker Studio (only because of the notice of 3 hours before it started) and some MS Paint. Welcome to “stem”, our first game, based around the theme ‘Minimalism’. We are ‘Fuzzy Pixels‘, a small team of newcomers to Ludum Dare, and to Game Jam’s in general. Having worked with each other before on a few other projects, we decided we wanted to throw our own coin into the proverbial pot, and this is our entry! Our game actually started well once the theme was announced on Friday. After a good few hours of brainstorming and catching up with each other we had fleshed out a great concept for our game; A simple design about a young, solitary flower wanting to break free out of a stagnating and decaying world. Even with the busy schedules that come with having “real lives”, we still managed to work together to create a stunning and simple game with a very solid game mechanic. Using the mouse to move the direction of the sunbeams, you help encourage the flower bud to grow towards the light, and help it escape the doldrums Collect water along the way to make sure the constant decay does not catch up to you, while avoiding many obstacles that flowers have when trying to grow. Rocks, hungry beetles, and even frosty snow. stem is currently a web-based game, created with Unity3D and exported to be played on nearly any internet browser. We have hopes to further this project and see it on other platforms as well, including mobile devices. We hope you enjoy our game, thank you! I finished Ludum Dare for the first time, and came out the other side with XYZ, and I’m damned proud of it. It goes without saying that I’d do it again in a heartbeat, but I didn’t expect to be saying those words yesterday. When time is running out and you don’t know what to do, its amazing how erratic you can become. I woke up at 8.30 (UK time), checked the theme and made some breakfast. My idea came to me nearly instantly. It was to be a game about the link between power and human relationships, and it was going to be mindblowing. The narrative and gameplay meshed together beautifully in my head, and I immediately started coding. Mistake 1: Don’t attempt to create an HTML5 engine from scratch. By 5pm I had my engine at a reasonable level (I’m still damned proud of that engine), and I quickly built up the mechanics of the game. Except they didn’t work. It was a game built upon 3 simple rules; 1. People seek power, 2. People gain power by taking it from others, and 3. The powerful need more power to sustain their egos; but I couldn’t balance my AI. Power, it seems, is a freight train. The 1% effect. I learned a valuable lesson about mankind, and lost 12 hours of coding. Mistake 2: Prototype everything, even your prototypes. What now? I spent the rest of the night trying to salvage my beautiful engine, attempting to justify using it at any cost. Every 15 minutes I would alternate between a new idea and attempting to fix the original game, swinging from delight to depression like a pendulum. Mistake 3: Cut your losses. By 3am I had finally given up. I sank a couple of beers and went to bed. All I have to show for 24 hours work. I woke at a more reasonable 11am, and rose feeling defeated. Bitter. Game designer ego does not take well to defeat. I couldn’t resist taking one last crack at the contest. This time, it would be different. It would be simple, concise and different. I chose Unity, my trusty silent compadre, and took a very small and underdeveloped part of a concept I had floating around my mind. Understanding 1: Work with what you know. It was to be the puzzle side of the fast paced racer which had been long ago silently converted into a fast paced racer with no puzzles (shameless plug – you can totally play the alpha of that game here). I cut everything from the idea that didn’t support the core, and carved out the perspective tricks brought forward by the excellent Fez. Understanding 2: If it can be cut, cut it; especially when the theme is minimalism. I started with a test level to make sure the concept worked. It worked. Satisfied, I started work on some essential middleware tools I would need to save time down the line. Creating and saving meshes from within Unity, that sort of thing. If you don’t know it Unity Answers is a beautiful place. This wasn’t fast, but it was worth it – I could create shapes and levels rapidly. I worked up the first 6 levels in an hour. I had 8 left, but I wanted a finished game as soon as possible. Understanding 3: Polish is 90% of your game’s appeal. I created a simple menu and a few more levels. With 6 hours left, I could spend plenty of time on sound and visuals. The style was born from effective of a single Unity filter, mimicking the beautiful world of Echochrome. I am not a sound designer, but FruityLoops makes it insanely easy to create quality sound in a short space of time (and skill). Despite all this, I submitted just 10 minutes before the deadline. I narrowly avoided the greatest mistake I could have made: Understanding 4: Allow an hour for submission. Screenshots within the Ludum Dare submission page lose their splendour and be aware that people pick games based on how they look, not the quirky name or genuinely original mechanic. Exporting and uploading too, takes time. I’m sure some Dare’ers missed the submission date by seconds, and they will have learnt this lesson the hard way. Keeping it simple in every way but the puzzles. That was my Ludum Dare. It had highs and lows, but there’s nothing quite like the feeling of finishing something you’re truly proud of, even if it isn’t objectively very good. But it’s not my place to argue whether I made a good game, it’s yours. You can play and rate XYZ here – I’d love to know what you think. Remember me ? Probably not, it’s only my second Ludum Dare and third game. The first one was Breeding Cubes for LD24, and the second one was HeartZ made with 3 others during the GlobalGameJam 2013. This time I choose to reproduce Harvest: Massive Encounter, an already minimalist tower defense game that I enjoyed a lot. I wanted to built a resource management game for a while already, so this LD’s theme was the perfect occasion. Its certainly minimalistic on the inspiration side, but I really wanted to built this one and that was all the motivation I needed. I tried to reproduce most of the mechanics : rock harvesting, energy production, energy propagation along the nodes (the feature that makes the game very cool and interesting to me) and building construction and functioning using energy. It’s clearly unfinished and unbalanced, but it’s playable. Move with arrows, place buildings with the mouse – click on them on the left then on the map (discard with right mouse). Note that you can not reload the game, you need to exit it and launch it again to reset the level, sorry about that. Still, I am pretty happy with it. I only worked like 25h on it and lost about 5h trying to fix bugs directly due to my inexperience with the the software and game dev in general. The good thing is that I feel like I have leveled-up ! It is made entirely with CraftStudio that you can still try for free for a couple of days. Depending on your OS, you may need XNA or Mono or -I am not sure what- to play. You can try the web built, but it does not work for me (stays stuck during initializing scripts). Thanks and GG everyone !